Tea Party this Friday! Tickets are $20 online or $25 at the door. 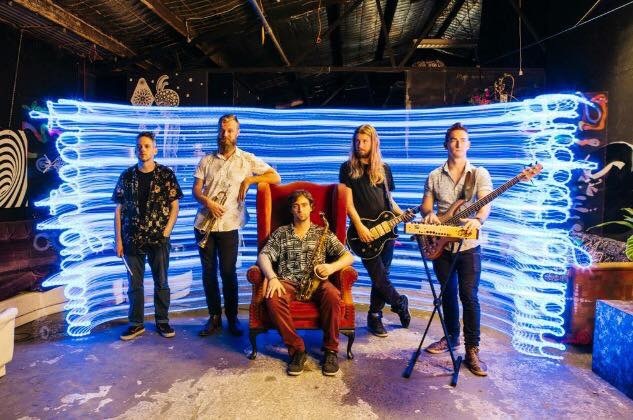 Midnight Tea Party is a 5 piece band hailing from Sydney’s Inner West. Gypsy, jazz, reggae and drum n’ bass are all blended together to form the band’s unique sound. Cutting it’s teeth on warehouse parties in Sydney’s inner west as well as numerous festivals MTP delivers a high energy live set that is packed with party vibes. Known for their genre bending compositions Midnight Tea Party’s third E.P. due for release in mid 2018 promises to be the group’s most exciting release to date. Expect deep, sub bass mixed with balkan inspired horn lines and a grunge-rock edge reminiscent of Gogol Bordello. Staying true to their roots, Midnight Tea Party create instrumental music with a modern edge that blends world music and electronic elements. A truly gifted artist, musician, photographer and full time surfer where all the hours in the day he finds to pursue hispassions never ceases to amaze the public eye. Musically Red plays all nature of guitars, drum and percussion, bass, harmonic flute, mandolin, didge and sitar. With a full vocal range.